The idea of food combining is an ancient one, practiced for thousands of years in Ayurvedic medicine and spirituality. However, the modern, Western conception of food combining is not spiritual and it is controversial. Proponents believe that combining foods properly leads to good digestion and prevents infections and cancer. Opponents admit that it can’t do any harm, but that food combining is completely unnecessary. Evidence suggests that food combining may not be an important or necessary practice for the average person with good digestion. But if you eat well, yet still struggle with gas, indigestion, heartburn, and other gut issues, you may want to give food combining a try. It certainly can’t hurt. Food combining is the idea that eating certain foods together and keeping certain foods separate will help you digest food better and will also help you absorb nutrients more effectively. When considering food combining, there are a few different categories of foods: proteins, fats, and carbohydrates. Carbohydrates are further broken down into fruits and starches. Some food combining plans break these down even further: fruits can be acid, sub-acid, or sweet and starches can be grains, starchy vegetables, or non-starchy vegetables. Some plans don’t include fat as a separate food, but include it with proteins. Never eat protein and starches together. Digesting protein and starch requires different enzymes and other chemicals. To digest each most effectively, they need to be eaten separately. You should wait two to three hours between eating one before you have the other. Proteins include any meat, but also nuts, seeds, and beans. Starches are grains as well as starchy vegetables like potatoes, squashes, pumpkin, peas, corn, and artichokes. Eat starches with non-starchy vegetables. Neither starches nor non-starches interfere with each other when being digested, so they can be eaten together at meals. Non-starchy vegetables include greens, zucchini, green beans, celery, broccoli, cabbage, asparagus, onions, peppers, and other vegetables. Eat fruits alone. Fruits are only mechanically digested in the stomach, not chemically. 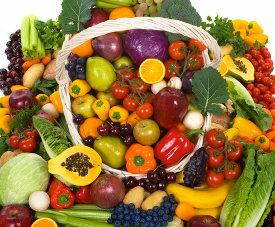 If eaten with other foods, it is thought, fruit will get left behind to rot in the gut. This may feed yeast and other unhealthy pathogens. Fruit combining can get more detailed. Some suggest you should never combine high-acid fruits, like citrus and pineapple, with sweet fruits, like bananas, dates, figs, or grapes. Never eat melons with anything else. According to proponents of food combining, melon doesn’t digest well with any other food, including other fruits. Avoid eating cantaloupe, honeydew, watermelon, and any other type of melon with any other kind of food. Some food combining plans get much more complicated with lists of rules and sub-rules, including how to eat pure fats, when and if to eat dairy, and how to eat cultured or fermented foods and beverages. For the beginner food combiner, the simple rules are a good place to start. The main point of food combining is to improve digestion. Anyone interested in nutrition and diet, whether proponents or opponents of food combining, will agree that our modern, western diet has caused us some serious digestive issues. Our ancestors had, and people in other parts of the world still have, a natural and healthy diet, which produces a varied and full micro-ecosystem of bacteria in the gut. This ecosystem aids digestion. The western lifestyle, including diet, has depleted this ecosystem, which is why so many of us struggle with indigestion. In one study, researchers compared the gut bacteria of children in Europe with those in Africa eating a diet similar to what our ancestors ate several thousands of years ago. The African children had many more bacteria, which allowed them to digest fiber better, to get more energy from food, and to avoid certain infectious and non-infectious diseases of the digestive tract. Recreating a better ecosystem in our guts may be complicated. More research is needed to figure out just how we can reintroduce bacterial species that aid digestion. In the meantime, for anyone struggling with indigestion, food combining can be a practical solution. If you’re interested in food combining from both a practical and a spiritual perspective, you might consider working with a practitioner of Ayurvedic medicine. This ancient Indian tradition includes a lot of holistic and natural approaches to wellness, including proper food combining. Ayurvedic practitioners believe that every food has a unique taste, energy and digestive effect. Combining foods with different qualities slows and confuses digestion. Ayurvedic medicine also says that each person is unique in how they digest foods and absorb nutrients. An experienced practitioner can guide you to an individualized eating plan that includes food combinations that are best for your needs. The rules of Ayurvedic food combining are complicated to the uninitiated. This is another reason to work with an experienced practitioner. Make all-fruit smoothies. Probably the most difficult food combining rule for a smoothie enthusiast is eating fruits alone. You’re probably used to mixing fruit with proteins like yogurt and with vegetables to. To obey the laws of food combining, just separate out the ingredients. Create fruit-only smoothies and use ice and water or tea for your liquids. Ideally use primarily berries that don’t contain as much sugar as most fruit. Eat these in the morning as food combining suggests fruit should be avoided later in the day. Separate your acidic and sweet fruits. If you want to get more detailed about fruit combining, some proponents suggest you should not combine sweet and acid fruits. Bananas, a staple of most smoothie recipes, are sweet and should not be combined with citrus, pineapple, pomegranate or any other fruits with sour notes. Include non-starchy vegetables in fruit smoothies. Many non-starchy vegetables are actually fruits, so you can bend the rules a little and include them in your morning fruit smoothies. These include bell peppers, tomatoes, avocados, and cucumbers. Greens are also considered acceptable to pair with many fruits, so consider throwing some spinach or kale into your fruit smoothie. Make a protein-rich smoothie for later in the day. Use yogurt, milk, nut milks, and nut butters as your proteins, ice to thicken, and honey or stevia to sweeten a protein-rich smoothie since you can’t use fruit. You can include non-starchy vegetables in this smoothie, but avoid starches like pumpkin, sweet potato or grains. If you are consuming more than one smoothie a day wait a few hours in between different types of smoothies. Food combining rules state that your digestive tract needs time to work on different kinds of food. Having a fruit smoothie followed by a protein smoothie soon after defeats the purpose of food combining. Wait two to three hours between eating your segregated smoothies. Here are a couple of recipes to get you started on food combining with smoothies. The fruit smoothie is great for breakfast, while the green smoothie is perfect for lunch time. Use these and the other recipes on this site as inspiration to create your own tasty recipes. Blend together until you get a good consistency. You can leave out some or all of the ice if you use frozen instead of fresh berries. Blend the ingredients together until you get a nice consistency. The avocado gives you the protein and fat you need to stay full, while the greens are packed with nutrients and the ginger aids digestion. What’s been your experience with food combining – has avoiding certain food combos alleviated your issues? Please share in the comments below. Thank you for such a well written blog about food combining. I’m on an Ayurvedic diet, and mostly cook my foods. I wanted to try smoothies in order to add fruits and vegetables to my diet in another way, but all of the recipes I found on the internet seemed like a bad idea to me, because of the combinations of sweet and citrus fruits and proteins and vegetables – all in the one smoothie!!! Then I found your blog… Cheers! You’re welcome, Cindy. Good luck with your smoothies! Do you know what the food combining rules are for bone broth? It’s a staple in our diets because we are healing our guts and remineralizing our teeth. What can bone broth be mixed with? Or, does It have to be consumed alone? Great question, Cindy. Bone broth can be consumed with anything. I would drink it alone and mix with other foods to maximize how much you consume. Nice article. I also wrote 5 Reasons to Drink Fruit and Veggie Smoothies at my blog. Thanks. Nice article too, Jack. Is it good to blend only fruits with no veggies or sugar? Most people are fine blending fruit and veggies. Avoid combing the two if you have issues, Ashely. Food combining can be challenging but well worth the effort. It has eliminated a life’s worth of flatulence, constipation, and nausea for me. When I combine proteins and starches, I can feel the difference almost immediately. Sometimes it really hurts! I highly recommend food combining for those having digestive problems. I use the most basic food combining rules and it works for me, so I recommend people start there. Absolutely eat fruits alone or before a meal. Also, legumes can be eaten with starches or proteins. Each individual needs to decide which combination works for them. I eat them with starches (e.g. rice and peas, potato and chick peas). Great article. I don’t post often, but I wanted people to know that there are real people out there with real, life-changing successes with food combining. Try it. It might work. You have nothing to lose but your digestive problems. Thanks for leaving an insightful comment, Tracy. I agree that anyone with digestive issues owes it to themselves to explore food combining or what not to combine. Hey Ryan, can I gain weight combining avocado or coconut oil to my smoothies and how much should I use. I use coconut oil in my coffee everyday and drink 2 smoothies a day with 1 additional meal. I don’t seem to be loosing. How much fruit is too much? Also I’m sugar addicted and my smoothies aren’t sweet enough, so I add Stevia. Thanks for your input. Please read my article on losing weight with smoothies – it will answer most of your questions. Stevia is a good option as a low calorie sweetener. Life changed soooo much for the better. Wow…from a skeptic to a happy foid combiner. Thanks for the article and explaining the basic chemistry facts of digestion. Thanks for leaving a comment, Robin. You’re a testament to food combing for those that are skeptical. What about banana and Acai or dragon fruit. I know you can’t combine banana with Strawberries as you can with other berries. Not sure about Acai… Thanks! You’re usually safe combining various fruits, Caren. If you suspect or experience an issue with banana and Acai or dragon fruit then don’t combine. Hi Ryan. Thanks for the article. I have a green smoothie (simple one green, blueberries, and avocado) for lunch everyday. I also have a side of protein with it (salmon usually, maybe some chicken or turkey). Is this ok? I advocate consuming smoothies on their own. However, if you’re drinking a “simple” smoothie with food and not experiencing any digestive issue then you should be fine. Recently been using 5 mornings a week straight after training but after reading your article it seems wrong? Your smoothie looks good! I’d only be concerned about combining certain foods if you’re experiencing digestive issue. Once critique, try incorporating some healthy fats in the form of coconut oil, ghee, or avocado. This is an awesome article! I just have a couple of questions: is it okay to have different coconut products together( coconut milk, coconut oil, coconut butter, coconut flour, etc.)? Also, since pure stevia is an herb, is it a neutral food that can be combined with anything? Also, is it okay to put lemon juice on meals? One more question: I buy bone broth protein powder and collagen protein powders. Can I combine these with anything or what do you think? Yes, it’s okay to consume different coconut product at once. Yes, I can’t think of anything you can’t sweeten with stevia. Yes, lemon juice can be used on most meals – where it wouldn’t negatively impact or enhance the flavor. That’s a good question. I would limit the number of things you combine with those protein powders. At the very least, pay attention to how you feel when combining with different foods. Sorry, I’m not familiar with serpentina leaves; so can’t say, Kylee. Is it good or bad to do an anti-Inflammatory smoothie with fruits and adding ginger and turmeric? It’s not a problem (good) for most people, Rabab. If you have digestive issues then remove ingredients one by one until you identify the culprit. can you combine beans with grains or sweet potatoes, like quinoa and sweet potatoes or quinoa and black beans, or black beans and sweet potatoes? Also, what about yogurt and berries? Yogurt and berries are fine to combine. I typically don’t combine beans with those, but you can try and see how you fair. I would like a copy of your free smoothie recipies. Hello There, I’m simply seeking proper food combining smoothie recipes and what have you(: That Free E-Book with 15 recipes looks nice!!! Fantastic article and super replies. I Have 2 questions regarding food combining. Today I am going to separate fruit from my protein powder + collagen powder w/kefir & 3-4 tbl of probiotic yogurt smoothie and see how that goes. I will wait 2 hours between these smoothies as you suggested (first, the berry, ice, berry juice + tsp coconut oil) then the protein one. 1. Is it okay to add the coconut oil to the berry one? 2. Is it okay to combine whey protein powder (unflavored) & hydrolized collagen powder for my protein shake. Thank you Ryan and please send me the Smoothie E-book. 1) Yes, it’s fine to add the coconut oil to the berry smoothie. 2) My gut response is yes. It’s something I’ve done for years and don’t see why not. E-book on it’s way – confirm your subscription to my free email newsletter to get access. Great article. What are your thoughts on adding protein powder to fruit smoothies in the morning (since the rules state eating fruits alone)? Try it and see how you feel, Kenny. Most people including myself have no problems with protein in fruit smoothies. I am confused. If for ex. combining split peas with apple juice is not acceptable, then how could split pea protein powder mixed with apple juice be acceptable? Or is it? But same goes for all protein powder drinks which are mixed with a fruit juice. Even though the protein is down to a powder, it is still protein and is still like having protein with a fruit juice. I have a sentive digestive tract and looking at food combinations to help. I make a fruit smoothie and add a plant based protein mix (brown rice, hemp and mushroom blend) to get needed protein and some greens. With food combining is the added protein going to make it hard to digest mixed with the fruit which ideally should be eaten alone. Blending banana with other fruits is fine. However, I’d reduce or omit the banana and use an avocado for thickness and to reduce sugar. The other fruits should provide enough sweetness. I try to eat within a 8-10 hour window each day. I think that’s more effective than eating certain foods at given times each day.